User friendly starter that offers an expanded feeding window. Formulated for young pigs from 25 to 65 pounds in bodyweight. 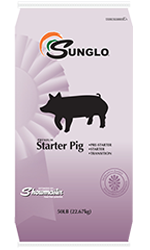 Can be used after Sunglo® Pre-Starter and also after Sunglo Starter.